Dragon Quest fans may have come away the most satisfied from Square Enix’s E3 2018 press conference, getting a new trailer, a release date, and news of a special edition for the upcoming Dragon Quest XI. The standard edition (deep breath), Dragon Quest XI: Echoes of an Elusive Age Edition of Light, will include a few in-game bonuses that boost health and magic recovery and grant your character skill points. 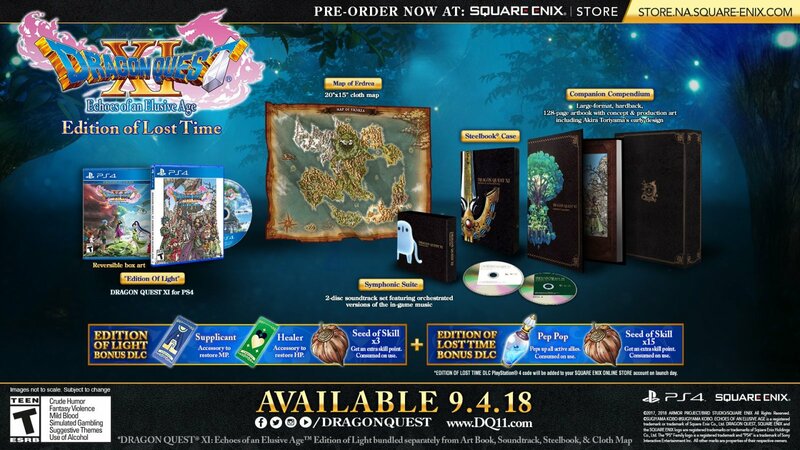 The Edition of Lost Time adds additional skill point and health recovery items along with a acloth map, a soundtrack CD, a hardcover art book, and a Steelbook case. Both editions are available for pre-order now at Square Enix’s website and are set for release September 4 of this year.